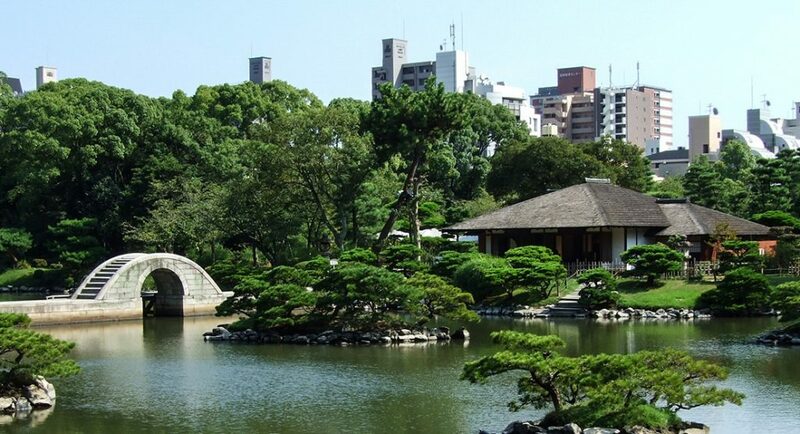 Hiroshima is a city with deep historical roots, evident in its ancient gardens and castles. During the 20h century, Hiroshima became the center of unenviable international attention after the first atomic bomb was detonated there on August 6, 1945 – destroying everything within two kilometers of impact. Like the phoenix of legend, Hiroshima and its residents emerged from the ashes. Historical structures were restored, and the city took on aspirations of continued peace. Today, it is home to over one million people and a favorite stop for international tourists, thanks to the bullet train. Hiroshima is the capital of the Hiroshima Prefecture and the largest city in the Chugoku region of western Honshu (main Japanese island). You will find travel to the deeply meaningful city of Hiroshima a breeze when using your Japan Rail Pass. Please be aware that Nozomi and Mizuho trains are not included. 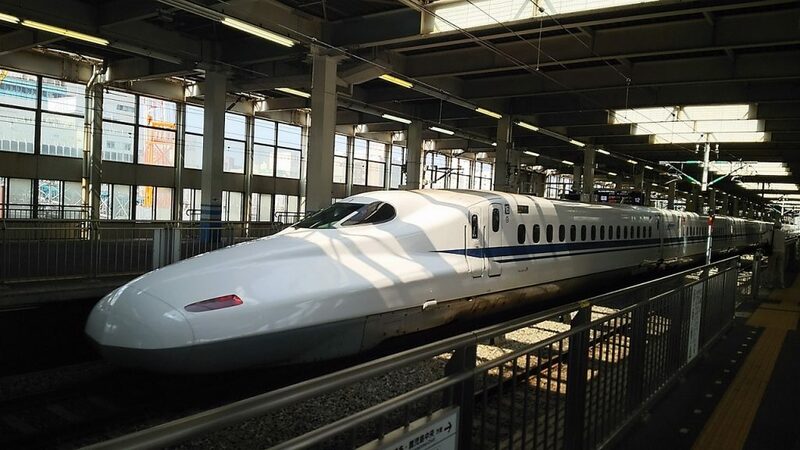 You can use your JR Pass to take the Tokaido Shinkansen line’s Hikari bullet train from Tokyo Station to Shin-Osaka Station, Shin-Kobe Station or Himeji Station. Once in one of these stations, you can transfer to the Sanyo Shinkansen (Sakura train) and arrive in Hiroshima at Hiroshima Station. This trip takes approximately five hours to complete. Non-shinkansen train lines are also available, as is an overnight bus. Several 90-minute flights also connect the Tokyo and Hiroshima airports each day. Kyoto and Hiroshima are connected by the Tokaido and Sanyo Shinkansen lines. You can use your JR Pass and the journey between Kyoto Station and Hiroshima Station takes 1 hour 40 minutes. The Nozomi Shinkansen trains only take 1 hour 15 minutes but are not covered by the pass. If you catch a Hikari or Sakura Shinkansen train, you may have to make a transfer at Shin-Osaka Station or Shin-Kobe Station. Either way, it will only add 10-15 minutes to your journey. If you do not have a JR Pass, an unreserved seat costs 10,570 yen (an additional 510 yen for a reserved seat). The quickest way to get to Hiroshima from Osaka is to catch a bullet train on the Sanyo line. The fastest train covered by the JR pass is the Sakura train which takes 1 hour 32 minutes. The Mizuho and Nozomi trains take 1 hour 25 minutes but are not covered by the pass. If you do not have a JR Pass, the cheapest way of making the journey is to catch a regular train. It takes 6 hours and you have to make several transfers but it only costs 5,620 yen (much cheaper than an individual ticket for a bullet train). However, if you plan to make just a couple of journeys in Japan, it makes sense to get the JR Pass. If you are flying into Hiroshima Airport, the city center can be reached by the shuttle bus. The bus ride lasts approximately 50 minutes. But the best option is to take the so-called Shiraichi Route (a combination of the JR Sanyo Shinkansen line and the shuttle bus). Take the shuttle bus from Hiroshima Airport and drop off after 15 minutes in JR Shiraichi Station (the closest JR station of Hiroshima Airport). There you will be able to take the train to Hiroshima Station, where you can also exchange your Japan Rail Pass. This route is less affected by congestion on the Sanyo Expressway, and is less expensive. 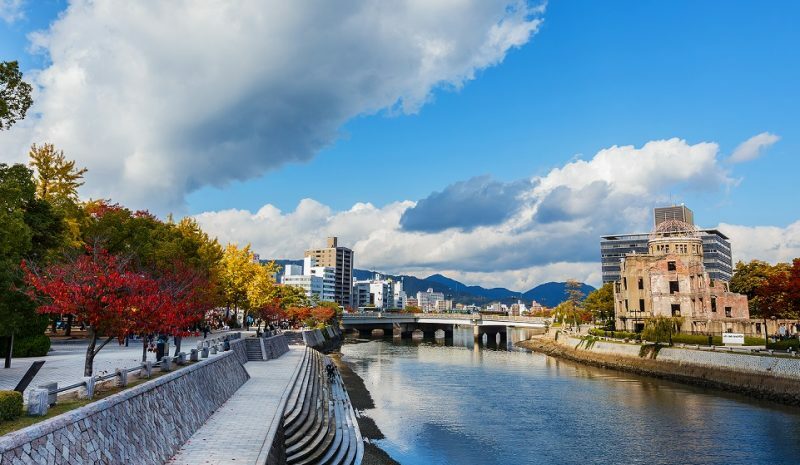 Whether you come to contemplate the past, look to the future, or enjoy the beauty of nature, Hiroshima is home to several attractions that can be found nowhere else in the world. Standing in contrast to the surrounding urban structures is the Heiwa Kinen Kōen, or Peace Memorial Park. This 120,000 square meter park marks the target of the atomic bomb. The area had been the center of commerce and politics in Hiroshima, but four years after the disaster it was decided that this portion of the city would not be rebuilt – it would stand forever as a symbol to honor the memory of nuclear horrors and advocate world peace. The park is home to the Peace Memorial Museum, which details Hiroshima’s history, the advent of atomic weapons, and the human suffering that followed. This moving exhibit includes graphic elements that may be disturbing to some visitors. This, however, makes the point that peace should not be taken for granted. A nearby tomb, called the Cenotaph, holds a register of over 220,000 names of victims of the blast. 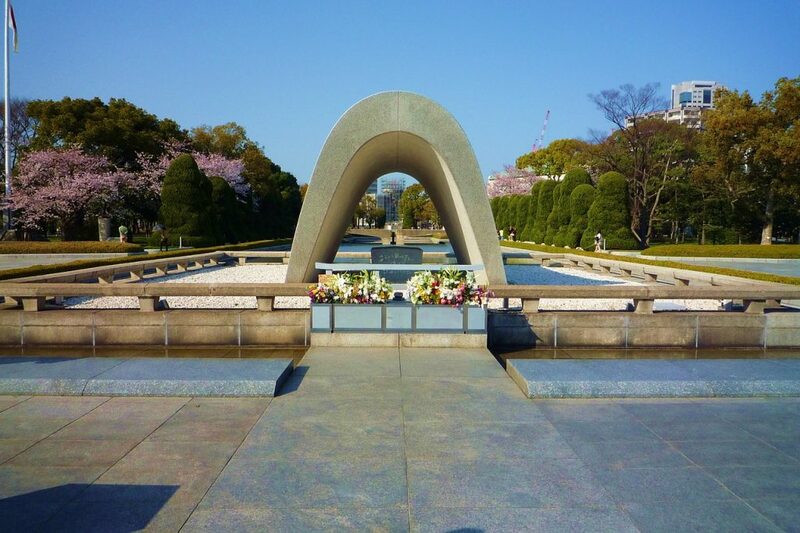 This monument is aligned to frame the Peace Flame and the A-Bomb Dome, making for great, symbolic pictures. Also on the grounds is the Hiroshima Peace Memorial, or Atomic Bomb Dome ( A-Bomb Dome). Declared a UNESCO World Heritage Site, this building was formerly known as the Prefectural Industrial Promotion Hall. The Hiroshima City Council decided in 1966 to indefinitely preserve the structure, so the shell that remains provides a tangible and undeniable connection to the events of that fateful day. Also called the Carp Castle, this five-story structure was originally built in 1589. The castle served as the seat of power as well as Hiroshima’s economic center. The original castle was destroyed by the atomic bomb but has since been rebuilt in the traditional fashion. 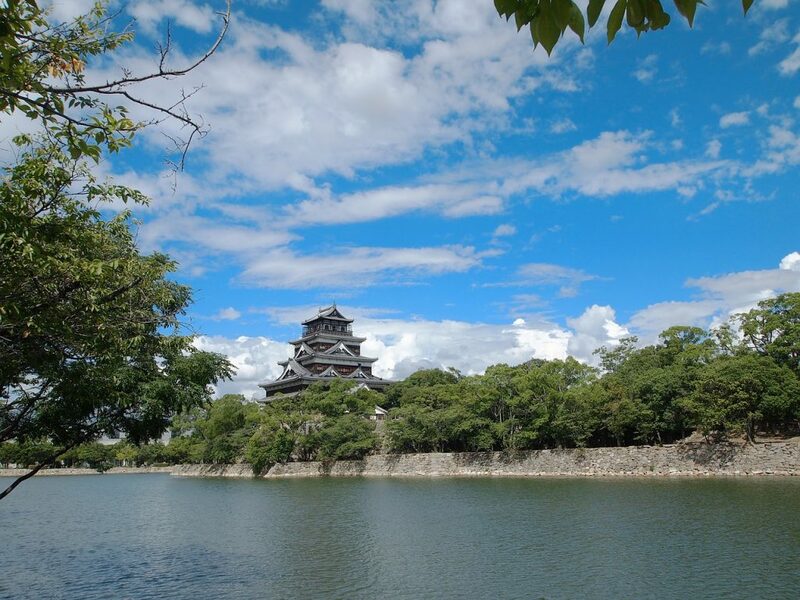 Along with the castle, its moat, shrine, and Ninomaru, or second circle of defense, were also reconstructed. The castle now houses a museum and visitors can enjoy scenic views of the city from its top floor. Constructed in 1620, this garden’s name literally means “garden of shrunken scenery.” The carefully cultivated plants and features mimic in miniature a mountainous, forested landscape. Visitors can enjoy the scenic views from the comfort of several tea houses, located around the pond. While traveling in and around Hiroshima, you may take advantage of the city’s tram network. The eight tram lines are extensive – the largest in Japan – with four of the lines passing through the main train station. Please note, however, that your JR Rail Pass is not valid on the tram lines. One-day passes for the tram lines can be purchased for ¥600. City buses provide another good transportation option. The Maple-oop (a combination of the word “maple” with the term “loop bus”) bus provides free transportation for JR Pass holders. This bus runs twice per hour and serves the train station, the Peace Memorial Park, Hiroshima Castle, Shukkeien, and other locations. Did you know that your Japan Rail Pass allows free passage on the ferries to nearby Miyajima Island as well? 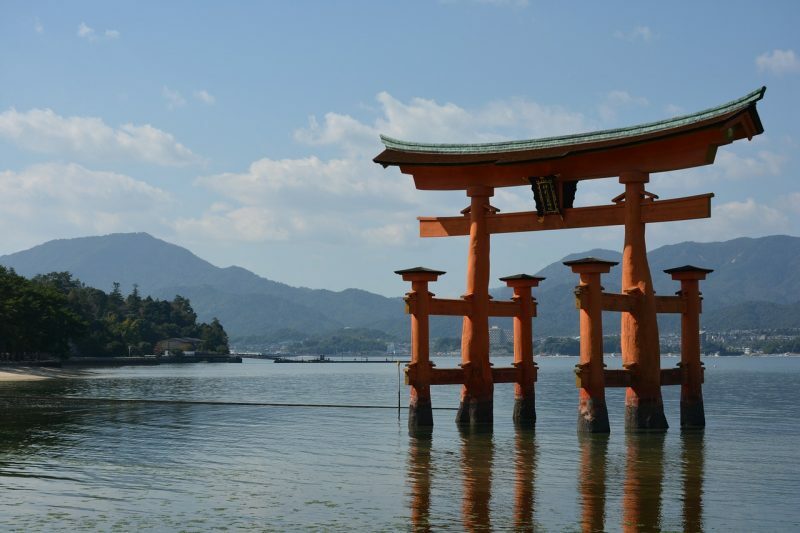 Check out our Miyajima travel guide for more on this small island famous for its torii gate and scenic views. The great Torii in Miyajima, near Hiroshima, marks the limit between the spirit and the human worlds. For in depth travel information on other destinations in Japan, please visit the destinations category of our article archives. We are flying into Osaka on 14 April around 1:10pm, and we wanted to go to Hiroshima on the same day and then travel back to our hotel that night. Hi Dee! Hiroshima is one of the most popular day trips from Osaka since you can take a JR train with your Japan Rail Pass. However please make sure to check carefully the operation hours at Hyperdia since timing may be tight. Happy travels! We are staying in Osaka and going to travel to Hiroshima and Miyajima. Would a stop in Himeji be possible on the Sanyo line? Hi Barri! Yes, it is possible with your Japan Rail Pass. The Sanyo Shinkansen line has stops in Osaka, Himeji and Hiroshima. We would recommend you to take the Hikari train from Osaka to Himeji and then to reach Hiroshima from Himeji you will have to take the Kodama (slowest service on the Sanyo line since it makes more stops). Happy travels! I need to travel from Hiroshima station back to Tokyo, may I know what is the best JR line I should take ? Hi Jovi! You can first take the Sanyo Shinkansen (Sakura train) from Hiroshima at Hiroshima Station to Shin-Osaka Station, Shin-Kobe Station or Himeji Station. From there, you can transfer to the Tokaido Shinkansen line’s Hikari bullet train to Tokyo Station using your Japan Rail Pass. Happy travels! Hi, I would like to visit Japan in April for the Cherry Blossom for 14 days. I will travel with my family (total of 4). We would like to explore Tokyo, Kyoto and Osaka perhaps Hiroshima as well. Please let me know what is the best itinerary for our trip? Can our JRP cover our trip from city to another city? I would be grateful if you can let us know. Hi Cicilia! We recommend you to check our Japan in 14 days: Travel itinerary for our best tips on how to make the most out of your 14-day trip with your Japan Rail Pass. My question is, i need to transfer only one time to be able to board the Sakura Shinkansen headed to Hiroshima Station, that is correct? Yes that is correct. Depending on the Hikari train, you will have to transfer at Shin-Osaka, Shin-Kobe or Himeji stations, only once. To get to Miyajima from central Hiroshima, just take a tram to the Miyajimaguchi ferry port. The good news is thatou can use your Japan Rail Pass to access the JR ferry for free. The ferry ride takes only about ten minutes. We hope you have an amazing time in Japan! etc. Can you advise the correct arrival station name by Shinkansen Sakura from Fukuoka? The station to which you will arrive is Hiroshima Station.